VMs must belong to the same platform — VMware vSphere or Microsoft Hyper-V.
VMs must have at least one valid restore point or must reside on a storage snapshot. You cannot add the same VM twice. For example, if you add a VM from the storage snapshot, you will not be able to add the same VM from the backup. 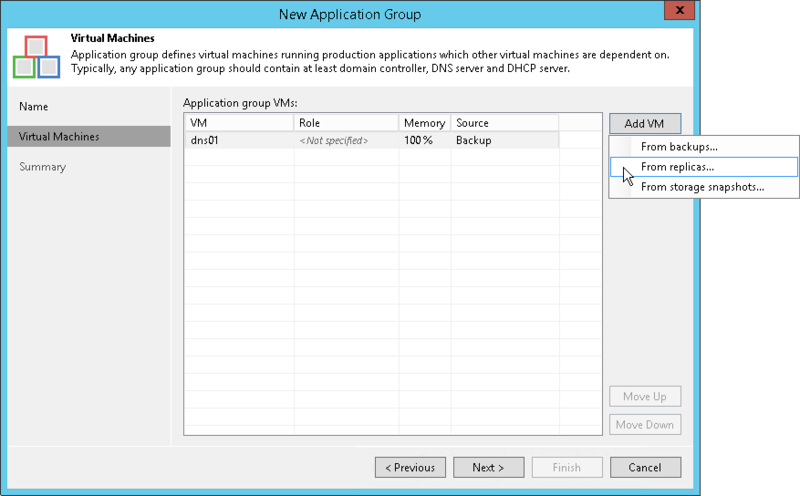 Click Add VM and select From backups, From replicas or From storage snapshots. In the displayed window, expand the job or storage snapshot, select the VM and click Add. VMs in the list are specified in the order of their boot priority. To move a VM up and down in the list, select it and click Move Up or Move Down.